These, however, have nothing on Long Lankin, a genuinely terrifying folk ballad beseeching us to 'Beware of Long Lankin who lives in the moss', lest he 'creep in' to the house and conspire with a baby's 'false nurse' to kill it by pricking it all over with a pin. I read this poem in a library book of traditional rhymes when I was a child and never forgot the horridness of it. For this reason, I was immediately drawn to Lindsey Barraclough's novel of the same name, the story of two girls in the 1950s who are sent from the East End to live with an estranged aunt in the country and discover that their family is haunted by a terrible curse. I wasn't disappointed. 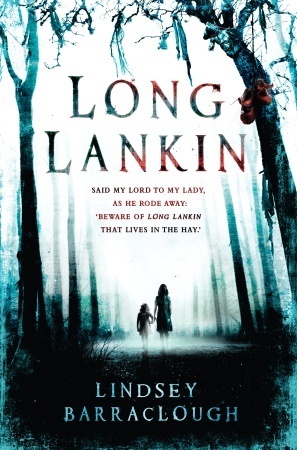 I gather Long Lankin is being marketed as a young adult novel but it absolutely stands up as an adult read. It somehow manages to be at times sweet and endearing - Cora and Roger, the children from whose points of view the story unfolds, are funny, honest and deeply loveable; I never tired of their company - and yet at times incredibly dark and utterly terrifying. There's a strong sense of eeriness that builds to full-on horror and a climax full of pace and tension. The sense of place is perfectly evoked, with all the fun of a childhood spent playing in country lanes and going to village cricket matches contrasted perfectly with the more unsettling elements of the rural England - dark woods, tidal marshlands, abandoned churches and mysterious folklore. The alternating viewpoints of Cora and Roger give us contrasting perspectives not just on the setting but of life in general. Cora is born and bred among the bombsites of post-war Limehouse to a feckless father and an unstable mother, and feels deeply protective of her little sister Mimi - I constantly wanted to hug her and relieve her of the terrible burden of responsibility that seems far too heavy for her young shoulders. Cheerful country boy Roger, on the other hand, has known nothing but security and stability: his younger siblings may wreak havoc but his parents are kind and his main worries are the need to do occasionally dished-out household chores as his mother's attention is focused on his more demanding brothers and baby sister. Every character in Long Lankin feels vivid and real, and even the supernatural elements of the story are all too credible. Although the pace builds very rapidly at the end, this isn't a novel that moves particularly fast, but this didn't matter to me; I enjoyed the slow build of the horror and also the growing friendship between Cora and Roger, built over many long summer days of wandering the countryside and, of course, going to all the very places they've been told to avoid. When the true horror of the Long Lankin legend really begins to unfold in earnest, it's all the more frightening. If I had to find fault with this book, it's that the switches in narration happen very rapidly at times - sometimes we only get a few paragraphs from one view point before we switch to another and back again - which sometimes felt jarring and a little disjointed. Apart from that, I'd really find it hard to pick holes in this one: it's an absolutely cracking read full of creepy atmosphere and out-and-out horror, yet also has an appealing warmth at its heart. I loved Long Lankin and when I say loved I mean I was terrified haha! Your review captures the essence of the book perfectly; I too enjoyed the slower, building tension and all the characters. It was sooooo haunting and creepy that I'm not sure if I could ever read it again even though I enjoyed it so much. I recommend it every chance I get. The sequel The Mark of Cain is just as terrifying and enthralling btw! Very excellent. It is incredibly creepy, isn't it? Very atmospheric and perfect reading for a dark autumn night. Somehow it had a similar atmosphere to a few books I read and children's TV dramas I watched as a child, when a lot of children's books and TV were just far creepier than they are now. I have just bought The Mark Of Cain so I'm hoping to get round to reading it soon.